Use to clear out sewer lines, septic tanks, and drain fields. Will not harm trees, shrubs, sewer, or drain pipes. 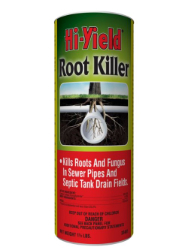 Formulated to quickly and economically kill and dissolve fungus and roots from trees and shrubs.